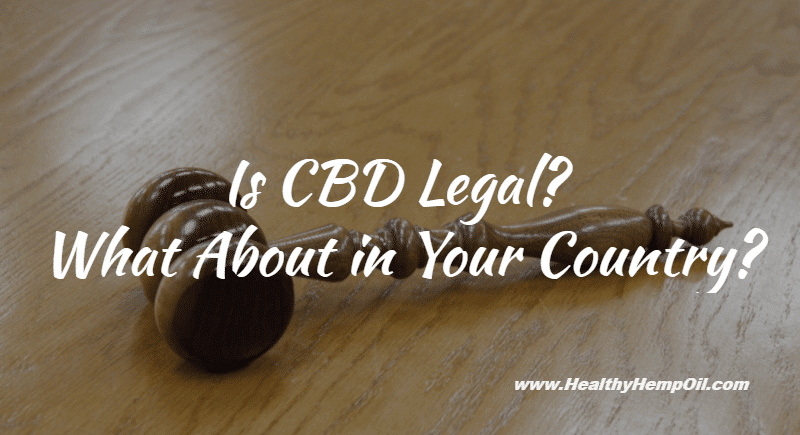 Want to find out if CBD is legal in your country? Hey everyone! It’s Brandon from HealthyHempOil.com. I wanted to come to you today with a question that I get asked all the time and that’s, “Is CBD legal?” Specifically for certain countries, everyone wants to know whether it’s legal in their countries so I’m gonna talk about that in a second. The products that we have on our website at HealthyHempOil.com only contain the component CBD and there’s a very, very negligible amount of THC in our products and there is absolutely no chance that you can get high from them because it’s such a very low level that’s present in the hemp plant itself. So if you’re living in the United States, it’s very clear that our products, all the CBD oil from hemp plants, they are considered 100% legal and they are considered a dietary supplement by the FDA. That means it’s legal to ship and consume throughout all 50 states within the US. Now for other countries, what we typically recommend is that you look into your Customs Department and you ask them if you are able to import dietary supplements from the United States because our product is a dietary supplement in the United States and we can ship it worldwide. The only problem is we don’t always know if it’s going to be received on your end. So if you check with your Customs Department and you ask them to see whether you’re able to actually receive dietary supplements from the United States then you should be good to go. So if you have any further questions about whether CBD oil is legal in your country or not, feel free to send me an email at [email protected] or send us or give us a phone call and that number is 1-844-HEMPOIL. All right that’s all for today. If you have any further questions or comments, leave them in the comment section below.